Performers include: Halle Berry, Goran Visnjic, Pierce Gagnon, Jeffrey Dean Morgan, Hiroyuki Sanada, Camryn Manheim, Grace Gummer, and Michael O’Neill. This science-fiction drama revolves around Molly Woods (Halle Berry), an astronaut who returns to Earth after a year-long solo mission in outer space. Her efforts to reconnect with her loving husband John (Goran Visnjic) and young son Ethan (Pierce Gagnon) are soon thrown into turmoil when Molly learns that she is pregnant. Her experiences in space and home lead to events that ultimately will change the course of human history. Molly and JD frantically race to the hybrids to stop a Humanich plot that will destroy the human race. Also, Lucy has a shocking realization about the GSC that forces her to question her allegiance and put Ethan at risk. First aired: September 9, 2015. What do you think? 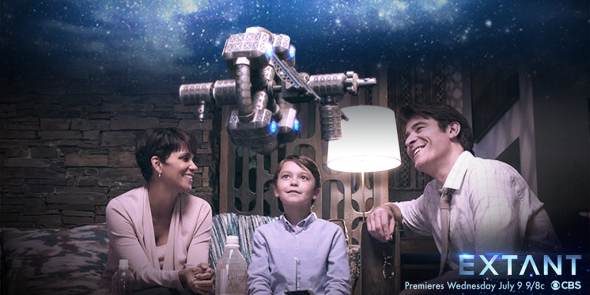 Do you like the Extant TV show? Do you think it should have been cancelled or renewed for a third season? Extant: Cancel or Keep the Halle Berry Series? It was a mistake to cancel the show, what the hell! I’m going to stop watching networks that don’t let shows go pass 5 seasons. if u begin something finish it pls …this sound for all cancelled serials that all of u are doing lately …. My name is Jo… This thing wouldn’t let me use my real name. I feel discriminated against. I’ve been wondering why this has not been on. I am so angry. You guys need to make shows last for a year (some reruns of course). When they are short series people forget about them. I really wanted to see what happened!!
? I loved the show there was a great cast that played believable characters (Plus I love Halle Berry. She’s an awesome actress). Loved the show. It should of been renewed. Was so looking forward to season 3. Viewers hunger for adult targeted sci fi with fantastic casts, so who was responsible for short-cirquiting us? I miss them. Whoever was responsible for this decision has no faith in imagination or forethought! I loved this show, please bring it back. I absolutely loved this show. Especially Ethan! I hate to even start to watch somethine new, because after you get hooked, they cancel it.